The PMP© Examination has a lot of formula questions which can be relatively easy if you know all the PMP formulas. You have 15 mins to write down any study notes before the exam starts so it is a good opportunity to write out all the formulas and use them during the exam. Here is the index of all the calculation formulas you are expected to know in the PMP examination…. Purpose: This formula is used by project managers when determining the number of communication channels required to effectively communicate to all stakeholders. Where n = number of members in the team. Tips of Exam: When counting how many people need to be communicated with in a project make sure to include the project manager. Example Question: A project manager is analysing the communications requirements for a project. T here are six team members, four stakeholders, and two subcontractors. He needs to find the number of potential communication channels. How many channels are there? Purpose: The PERT Three Point Estimate technique is a type of three point estimate. The only difference is that it applies weighting so that the most-likely estimate is weighted 4 times more than the other two estimates (optimistic and pessimistic). This formula is most valuable in estimating time or cost of activities for projects that are especially unique, such as in research and development where there are many unknowns. Example Question: You’re working on a IT project to setup a development environment, including designing and building a computer room, installing the operating systems and software, and performing a security evaluation. Your team comes up with a best-case scenario for the activity that involves ordering and installing the equipment. If everything goes perfectly, they feel it will take five weeks. However, they think it’s much more likely to take nine. A team member points out that on his last project, there was a major equipment delivery delay that cost the project an extra four weeks, and the rest of the team agrees that this is a possibility in a worst-case scenario. Use PERT analysis to calculate how long you should expect this activity to take. Purpose: Standard deviation is a measure of precision, smaller standard deviation higher precision. Example Question: If a task has been estimated at O = 4 days, P = 9 days amd M = 7, what is the standard deviation? Purpose: Under the assumption that those values are accurate this formula is used to select options among courses of action aka quantitatively prioritize a risk within a set of known risks. The sum added to calculate total. Impact positive figure if positive impact! Impact negative figure if positive impact! 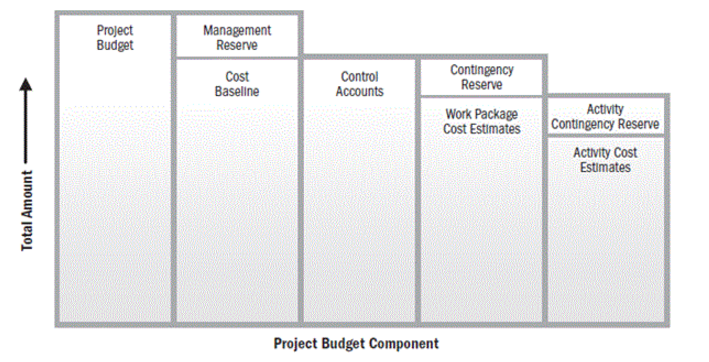 Example Question: You’ve identified two risks and an opportunity for your project. Risk A has a probability of 35% and a cost of $500. Risk B has a probability of 60% and a cost of $750. Opportunity C has a probability of 10% and a value of $1,000. What’s the total EMV of Risk A, Risk B, and Opportunity C? Exam Tip: Float is pretty easy to calculate once you have the Early Start, Early Finish, Late Start & Late Finish for activities. You can calculate these using the forward and backward pass. There is a very good explanation in the below video…. Example Question: Given this portion of the network diagram to the right, what’s the ES of activity F?